You know that garden bed you have that is dull and lacking color right now? Want to brighten it up with bursts of color and interesting textures for seasons to come? Liven up your winter garden with 7 perennial plants that flower in the colder weather. In our DIY Garden Minute Ep. 50 - "Winter Flowering Plants to Liven Up Your Garden," we'll explain 7 different examples of winter-blooming plants that brings us color year after year. This episode is meant for any level of gardener who wants to learn how to brighten up their winter garden with 7 specific plant suggestions. For a free cheat sheet list of over 15 winter flowering plants click here! Winter plants not only survive outside in the cold and frosty conditions, they actually produce blooms with colorful flowers depending on the plant! These perennial plants will brighten up your pots, walkways, and beds with their spots of color in the dead of winter. Whether you are ready to plant now or planning for next winter, there are many options to choose from. Today's topic is "7 Winter Flowering Plants to Liven Up Your Garden"
We feature 7 amazing winter plants for you to consider. However, there are so many other plants to choose from, so go to our Free Resources Page and download our entire list of Winter flowering plants! Also be sure to read our Camellia plant profile to learn more about this exceptional landscape and tea plant! There is also our Hellebore plant profile and our Daffodil plant profile! If you don't have time to read each one of these, you can click on the links in this episodes show notes or on this episodes webpage to then find and download each plants profile sheets to read later. They are also available on our Free Resources page! Subscribe to our Spoken Garden community and receive your FREE winter flowering plants cheat sheet! - A list of over 15 various perennial flowers, shrubs, and trees you can plant in your winter garden! - Includes both USDA and Sunset zones, Latin names, general flowering/blooming times, and plant flower colors. 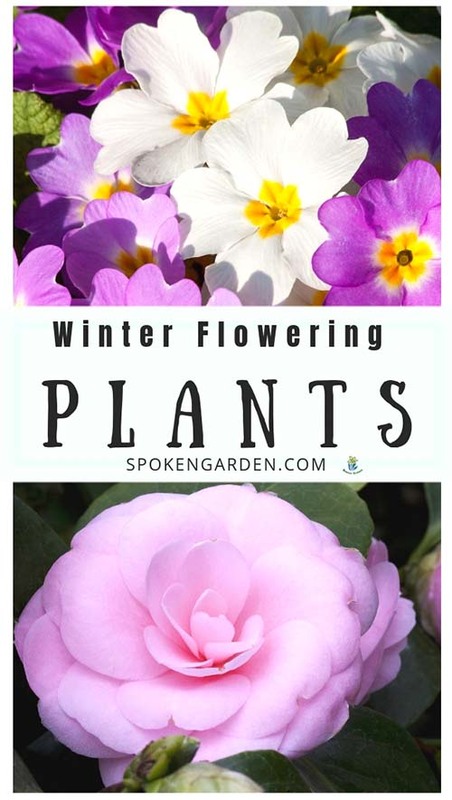 Click the graphic above to save "Winter Flowering Plants to Liven Up Your Garden" to Pinterest for later! Learn about 7 flowering plants that bloom in the winter and could add color to your garden! Ideas for brightening up your yard this winter. 7 perennials you can plant for winter color.